Whoever said that the simple things are often the best, was a legend. I have proof. What am I talking about? Well a couple of weeks ago, I'd gone to lunch with a friend. Obviously, I had to have the smashed avo toast - beautiful rye sourdough, topped with a generous amount of smashed avocado. This particular version of it was then topped with a simple salad that was so very good, I had to try replicating it at home. It was just a beautiful and well balanced little number, with every mouthful, I could literally hear angels sing. Since the salad was so simple, there is very little to do to assemble it. This makes it perfect if you have to make a great big batch to feed a crowd this holiday season. The homemade version was so good, I hardly got a couple of bites of it. The husband, who initially was very skeptical about the simplicity and the 'no mayo' nature of the salad, almost wiped the plate clean. So I can tell you that this recipe has been tried and tested and has received the highest seal of approval (well, in my house atleast). This is not an exact recipe. You simply add the ingredients to your liking and taste and it will turn out fantastic. 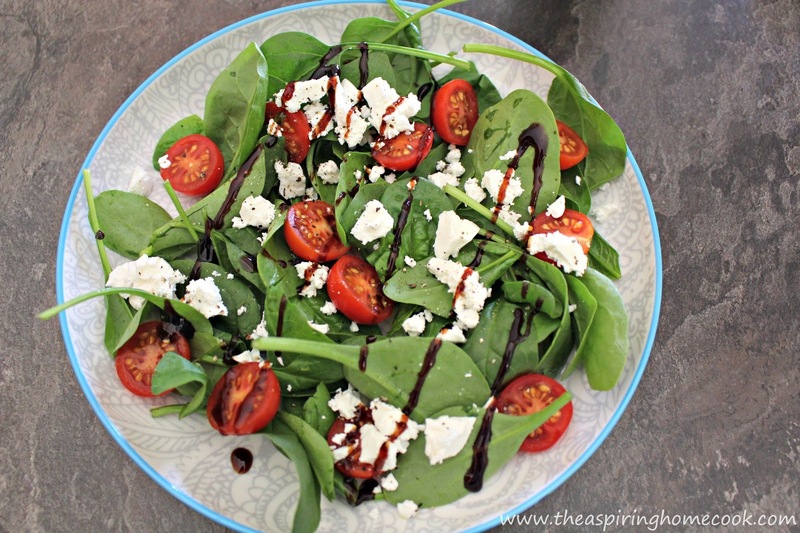 Place the baby spinach / salad greens on your salad plate. Halve the cherry tomatoes and place it evenly around the plate. Sprinkle a little freshly cracked black pepper on top. Drizzle a little balsamic glaze over everything to finish it off. Sit back and look at this gorgeous work or art.